Includes: All Ten Lessons, review of all homework, and a beautiful signed certificate upon completion. Projects such as making an herbal first aid kit, designing an herb garden, or making your own herbarium and plant press. 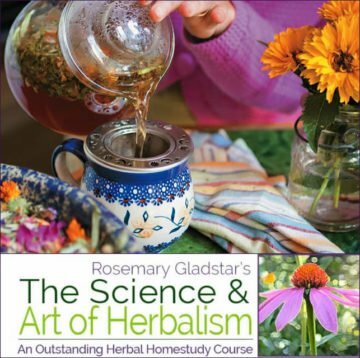 The Science and Art of Herbalism Home Study Course is a ten lesson course taken at your own pace, with homework review and guidance provided by carefully selected herbalists and Rosemary herself. Though it thoroughly instills in the student the practical skills necessary to practice herbal home health care, it doesn’t ignore the rich spirit and essence of herbalism. The heart of this course is the development of a deep personal relationship with the plant world. Many of our students have written telling us that this course has been transformational and one of the most self- empowering studies they have undertaken. At the end of the course you will receive a beautiful certificate of completion that you can proudly display in your home, store or office! Thousands of people have taken this herbal journey with Rosemary over the past 25+ years, bringing herbal healing into their homes and communities. 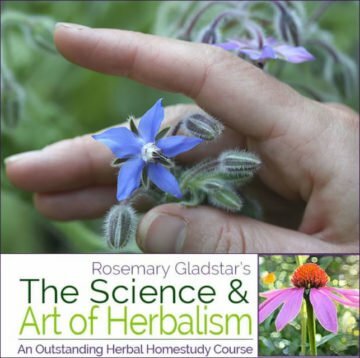 As herbalism continues to spread its roots and grow in communities across the globe, Rosemary recognized that an online version of the Science and Art of Herbalism would benefit many of her students. Computer savvy herbalists, Jason Colvard and Helen Ward spent countless hours creating the online format for the Science and Art of Herbalism, with the same core content as the classic printed version. Online students will benefit from all of the magic of the digital world – from videos, online peer communities, an herb of the month feature and a faster turnaround time on homework review. There are still many of us who, like Rosemary, would prefer to curl up with a cup of tea by a sunny window, and read the course material in book form. Or perhaps there is no easy online access where you live. The printed course is as wonderful as ever, and there is an “unlimited” amount of time to finish the course – truly at your own pace! You will have the option to send your homeworks in for review via the postal mail or e-mail. For those who want the best of both worlds, there is an option to purchase both the online and printed versions. If you would like to sample the course, you are welcome to order the printed Lesson 1. (At this time we are not able to offer a digital/online preview.) If you are enchanted by Lesson 1 you can continue with your studies by selecting the Lesson 2- 10 option, either printed or with the online course, or decide to enter the online course. Rosemary weaves the magic of nature, a reverence for life and a commitment to share the wisdom of herbs with others throughout her teachings. We can’t wait to have you join her on this journey into the green world! 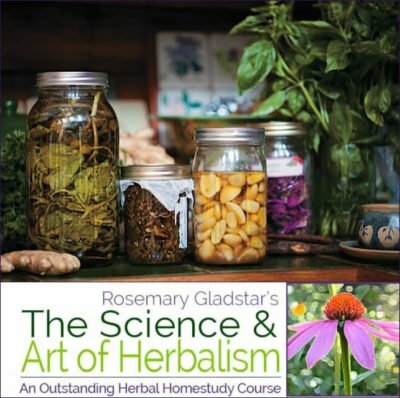 Considered by many to be one of the finest home study courses on herbalism available in this country, The Science & Art of Herbalism offers a comprehensive overview of herbalism and prepares the student to competently and effectively use herbs for home health care. It’s an excellent introduction for the beginner/intermediate herbalism student. For the more advanced student, it provides an excellent review and a solid foundation upon which to build their own studies. Lessons are written by Rosemary Gladstar. 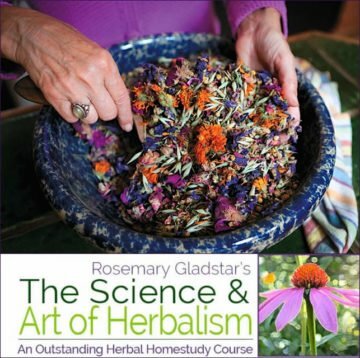 Rosemary has been practicing, teaching, using and loving herbs for over 40 years. She’s the author of nine books on herbalism including the immensely popular Herbal Healing for Women (Simon & Schuster), Herbal Recipes for Vibrant Health, and Medicinal Herbs, a Beginners Guide (Storey Book Publications). She is the founder of the oldest running herb school in the United States: The California School of Herbal Studies. Rosemary is also the co-founder of Sage Mountain Herbal Retreat Center and Botanical Sanctuary, and founding president of United Plant Saver’s, as well as co-founder and director of The International Herb Symposium and The New England Women’s Herbal Conference. She has traveled worldwide learning and teaching about herbalism, and loves this green world with a deep and abiding passion. She brings this depth of love, passion, and understanding to her writings and transforms what might appear to be a simple course on herbalism into a life transforming journey. The Lessons are designed to provide practical, hands-on experience with each assignment designed to enrich your personal experience with the plant world.